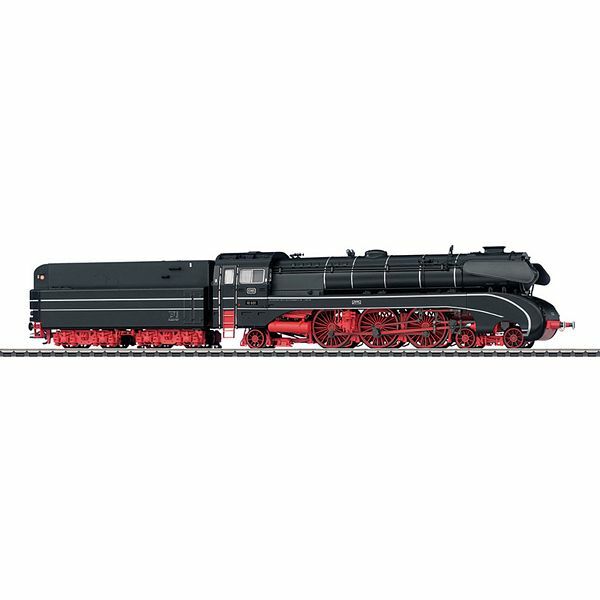 Prototype: German Federal Railroad DB class 10 express steam locomotive. Oil tender and main firing by oil included. Model: The locomotive has an mfx+ digital decoder and extensive sound functions. It also has controlled high-efficiency propulsion. 3 axles powered. Traction tires. The triple headlights change over with the direction of travel. They and the smoke unit that can be installed in the locomotive will work in conventional operation and can be controlled digitally. The running gear lights can also be controlled separately in digital operation. The 72270 smoke unit can be installed in the locomotive. The locomotive and tender are constructed mostly of metal. There is a close coupling between the locomotive and the tender that can be adjusted for the radius of the track. The minimum radius for operation is 360 mm / 14-3/16". Brake hoses are included separately. Length over the buffers 30.5 cm / 12". Newly designed cab with an open view through it. Improved locomotive and tender spacing. A DC model of this locomotive can be found in the Trix H0 assortment under item number 22104. Elegant Oil Steamer - The two class 10 express steam locomotives developed from scratch and placed into service in 1957 at the initiative of the German Federal Railroad were supposed to replace the class 01 and 01.10 locomotives, who were getting on in years, as motive power for modern long distance passenger trains. These DB parade locomotives were built by Krupp and were equipped with partial streamlining, which was supposed to decrease wind resistance and protect the cylinders from to much dirt. Road number 10 002 was equipped at the time of entering service with an efficient form of oil firing. The high performance boiler of welded construction was used in new locomotive construction and had already proven itself very well in the DB class 01.10 locomotives rebuilt starting in 1953. This design gave both of these new locomotives tremendous reserves of power with 2,500 horsepower / 1,840 kilowatts. Nevertheless, the era of steam motive power was clearly nearing its end due to the rapid electrification during the 1960s. These two elegant steam race horses thus remained a single pair despite the instructive results achieved in operation. They are a pair that is still among the legends of that era.